How "Ready" Is Iran To Talk, Really? This analysis was written by CBS News correspondent Elizabeth Palmer, who just returned from Tehran. President Mahmoud Ahmadinejad's declaration — that "the Iranian nation is ready for talks (with the U.S.) but in a fair atmosphere with mutual respect" — could mean everything. Or nothing. Although he was speaking at the vast rally in Tehran marking the 30th anniversary of Iran's Islamic Revolution, Ahmadinejad is also a politician on the stump. He's campaigning for re-election as Iran's President in four months. Those in the crowd who long for better relations with the U.S. will have heard in the President's speech a promise of rapprochement. But to those who fear America — as many do — the phrase "mutual respect" means Iran won't negotiate if there's any pressure to stop its nuclear program or its support of Hamas and Hezbollah. The festivities celebrating the 30th anniversary of the Islamic Revolution have been going on for the past 10 days, and they've been studded with decidedly unfriendly messages to the United States. On Jan. 31, a crowd gathered at Ayatollah Khomeini's tomb chanted "Death to America," led by one of Iran's most senior clerics and politicians, Hashemi Rafsanjani. Two days later, Iran fired a rocket carrying its first home-built satellite into space — an unambiguous demonstration that Iran has developed powerful missile technology, with obvious military applications. Then, on Feb. 4, Iran abruptly refused to issue visas for the U.S. women's badminton team after having invited them to participate in a tournament in Tehran. The event would have been the first U.S.-Iranian exchange since President Obama's inauguration. A carnival atmosphere reigned at today's rally, reports CBS News Leily Lankarani. There were drawing competitions for children, marching bands, free hats and snacks. There were also banners that read "Down with the USA". How many people who turned out at the rally really do want improved relations with the United States? There's little reliable data, but one poll from a year ago found just over half of Iranians questioned (57 percent) favored open-ended talks with the United States. But it's much less clear what proportion of the revolutionary Islamic leadership favors rapprochement. During a trip to Tehran last week, I was told by a senior figure in the regime, "It is better for us to have frozen relations with America. Certainly there is no immediate benefit to better relations, and the citizens of Iran don't think it's a priority. They can't see how a rapprochement would concretely improve their lives." Some progressive clerics and political leaders do see how better relations could improve Iranian lives — with freer travel, improved technology and much-needed investment. But the Iranian leadership is trapped by its own rhetoric. "Death to America" is more than just a slogan left over from the late 1970's when the U.S. supported the Shah. It is a political tool that has allowed the regime to blame any setback on America — from the weak economy to unrest among ethnic minorities. Giving it up will require deft revisionism, as well as courage — especially if negotiations bring pressure for political and economic reforms. 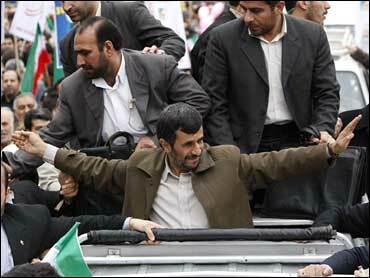 As a gifted populist politician, Mahmoud Ahmadinejad knows this as well as anyone. That's why his comments today are so usefully ambiguous, designed to buy time while he and the rest of the leadership contemplate their next move.